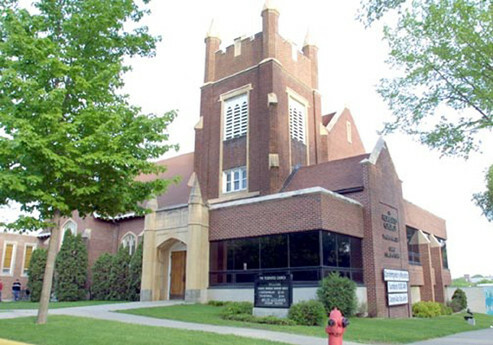 Back in 1872, when both the Presbyterian and the Congregational Churches organized, the population of the village of Fergus Falls was about 150 people. In fact, there wasn’t much of a town to speak of: only about a dozen homes, a temporary hotel, and a few apartments over stores. There were even fewer professed Christians in town, only sporadic meetings led by the occasional preacher who came around on the circuit. The Rev. Dr. M. S. Goodale, a Presbyterian minister from Amsterdam, NY, came to Fergus Falls to visit his cousin, Eli W. Dewey, and to hunt prairie chickens. When he discovered that there was no English-speaking congregation in Fergus Falls, he resolved to go home and solicit funds that would help the citizens build a church. At a meeting held on May 10, 1872, 25 families agreed to organize The First Presbyterian Church. Dr. Goodale succeeded in raising $1,500, which was enough for the building, the understanding being that the members were to furnish it. They did so by having a number of socials, suppers and other affairs. The original building measured 25-feet-by-50-feet with just a small cellar under it. The church sat on the southeast corner of the intersection of Whitford and Summit Avenues. In August 1872 the church held a big supper to raise the money for furnishings. The entrance charge was 10 cents to look at the church, and 50 cents if you wanted to eat. On September 15, 1872, Dr. Goodale returned to the city for the service of dedication. The congregation was justifiably proud of the fact that the church was dedicated debt-free. Captain James Compton, who had arrived in July of that summer, was the first Sunday School superintendent, and his wife was the organist. Dr. Goodale supplied the pulpit of the church while he stayed in Fergus Falls. The first regularly called minister was O. W. Winchester, who came in 1873. The Presbyterian Church building was used by the Congregationalists (organized February 26, 1872) until they built another church the following year. The Scandinavian church organization also used the building until they built their own. Throughout the 1870s, both churches had church bells which rang every Sunday morning and evening. During these early years, the nearest railroad – the St. Paul and Pacific – passed some 25 miles away. This period also suffered a two-year grasshopper plague, during which time the pesky insects chewed up everything green. The citizens received help from the state to get by, and somehow the churches managed to keep going. Ludwig Wolfsen of Minneapolis organized The Congregational Church on March 3, 1872. The first church meetings were held in a hall over a general store located on the southeast corner of the intersection of Washington and Union Avenues. In the midst of the grasshopper plague and the resulting economic hardship, no thought was given to building a church. For the first few years the congregation met in homes, in a school or in local meeting halls. They even met over a saloon a few times, an idea soon abandoned as worshipers were tempted to look through the cracks in the floorboards at the bar’s patrons below. The arrival of the railroad on Thanksgiving Day, 1879, meant a big boom for business and a rise in the town’s population. In the fall of 1886, The Congregational Church called the Rev. C. E. Page, who soon led the effort to build a real brick church. His theory was that a church out of debt was dead. He commenced to raise funds in Minneapolis and St. Paul, and by May 13, 1888, the congregation dedicated the new church which included a fine pipe organ, electric lights, pews, carpets, and other things that were far ahead of anything in this area of the country. In 1888, at the dedication of the Congregational Church, several visiting ministers spoke to the congregation. One was Rev. Kellerman of Grace Methodist Church, who was famous for raising money and who was on hand to raise money to pay the balance on the church. Some opened by giving $200; then another said he would be one of ten to give $100, and soon, $1000 was raised. Mr. Kellerman enlivened the congregation with some witty remarks and a stray shot or two from some of the other ministers. After the $100 pledges, he called for $50 pledges, then $25 pledges and $10 pledges, ending with $1 pledges from the children. In total, $2,250 was pledged, thus clearing the church of all debt. In 1903 the Presbyterians built a new church on the west side of South Court Street. Fire destroyed the original Presbyterian Church on Whitford and Summit Avenues and the adjoining parsonage in April 1913. Apparently the fire started in a neighboring barn; then a hot, dry wind fanned the flames which consumed the church in about fifteen minutes. The Congregationalists had a fine building on a good site but their numbers were small. The Presbyterians had more members and money, but their site was not as good. The two churches began to talk of federating and agreed to a three-year trial federation beginning in 1911. In 1914, it was unanimously voted to continue for another five years. In May, 1919, the federation was made permanent. The Rev. Archibald Herries (1911-1914) served as the first pastor of The Federated Church. He was followed by the Revs. E. T. Ferry (1915-1921), J. Richmond Morgan (1921-1925), Charles Gerlinger (1925-1932) and George Stickney (1933-1939). On June 22, 1919, a cyclone devastated 44 city blocks in Fergus Falls, killing 57 citizens and injuring 200. The storm destroyed The Federated Church, and damage to the town was estimated at $4.5 million. The Rev. E. T. Ferry of The Federated Church headed the effort on food distribution, and the Red Cross solicited 2,000 loaves of bread from families in Minneapolis-St. Paul to aid the residents of Fergus Falls. The Rev. Ferry gave the invocation at the all-denominational memorial service held. The congregation laid the present Federated Church’s foundation a year later (1920). During the rebuilding, worship services were held in the Lyric Theatre and other public buildings until the completion of the present building in 1923. With the Rev. J. Richmond Morgan at the helm, the church often worshiped in a local creamery, and thus was dubbed by a local wag, “the Church of the Holy Creamery.” John Lauritzen designed and built the present church building at a cost of $60,000. Mr. Lauritzen also built the Post Office and The River Inn in Fergus Falls. On February 22, 1922, a large congregation attended the dedication of the new basement of The Federated Church. The hall accommodated 350 people. It is described as a “cheerful and comfortable” space which served as the primary worship place until the completion of the sanctuary. The room boasted a kitchen and a room for use by the pastor. At the Good Friday service on the Friday following the dedication, sixty people joined the church, and eight people (youth and adults) received baptism. The choir anthem was For God So Loved the World. R. J. Angus, chairman of the Board of Managers, laid the cornerstone of the current building on Sunday morning, June 17, 1923 at 10:45 AM in an outdoor ceremony. Mr. Angus acted as the representative of both the Board of Trustees of the Congregational Church and the Board of Trustees of the Presbyterian Church, but in his remarks he stated that he was, first and principally, a representative of the members of The Federated Church. Mr. Angus further expounded: “We are early pioneers in the now much written principal of Church Unity. Under its say, sectarianism will be a thing of the past and for it will be substituted the assurance that we all belong to a great united family and worship one common God.” He went on, “May the beauty of this structure, whose cornerstone we lay this morning, be symbolic of the relations which must always exist among us in order to make this Federation a success and may we all cooperate to make it such a single success that the generations to follow us may say, ‘They built better than they knew.’” The final dedication of The Federated Church facility occurred on April 6, 1924. In 1939, the congregation called the Rev. William J. Van Dyken, who served faithfully until 1974 – the longest tenure of a Federated Church pastor to date. Rev. Van Dyken is described as “a vibrant personality” with great “enthusiasm for life,” a man who was “broadly spiritual rather than narrowly religious.” He is considered by many who grew up in the congregation to be a “mentor” and “the standard against which all other ministers [are] measured!” A committed pacifist, Rev. Van Dyken led the congregation through World War II, the Korean War, and the Vietnam Conflict; he is warmly remembered for promoting peace on the corner of Lincoln and Union Avenues each Sunday afternoon. After leaving our church, Bill and Marjorie Van Dyken established a scholarship fund which still provides assistance to high school students wishing to pursue higher education. The congregation grew and expanded through the years, adding the Christian Education annex (1952) at a cost of $70,000, a new manse on Ada Street (1985) at a cost of $30,000, remodeling the Fellowship Hall (1964) at a cost of $40,000, and renovating the chancel (1964) by building on the south choir loft, adding new carpet and installing pew cushions. Remodeling projects completed in 1989 included expanding the narthex, changing the front entrance from west side to north side, installation of new sound system, handicapped accessible aids, and an elevator. New instruments enhanced our worship life, most notably a Baldwin digital organ (1994) which replaced the pipe organ when it was deemed too costly to maintain, and a Kawai baby grand piano (2014). Tuesday School was an important feature of The Federated Church life. On Tuesdays, public schools dismissed students early for religious instruction and Bible study. Most students seized this opportunity, because if you didn’t go to Tuesday school you had to sit with the teacher in the public school classroom until 3 p.m. Students at Tuesday School learned Bible stories and some of the great hymns of our faith. No child growing up in The Federated Church during the 1940s and 1950s could ever forget the untiring efforts of Miss Elizabeth Featherstone, who served as a Sunday School teacher and later Sunday School Superintendent. Miss Featherstone is remembered as a “frail, little thing with wispy hair”; a “wonderful, gentle teacher who knew the power of words”; a “dedicated, single lady (in those days we said ‘maiden lady’)” and as a “dear, dedicated, elderly woman who instructed us in Tuesday School insisting we memorize many Bible verses and Psalms.” One student recalls: “She expected a lot of memory work from us and the large part of scripture I remember today is a result of her persistence in having us hide it in our hearts as young people.” Another admits: “Old Miss Featherstone, God bless her, whom I hated at the time because she made us memorize so many scripture verses. Now I am thankful she never gave up on us!” Miss Featherstone also taught the children the game of chess – which she said was an excellent “thinking” game – during Sunday afternoon sessions at her home. In 1953, Walt Wenino led a movement to organize youth groups for the congregation, and in 1954 the Deacons & Elders gave their approval to hold square dances in the church hall, although card playing was still discouraged. The United Church of Christ came into being in 1957 as the joining together of four denominations: The Congregational Church, The Christian Churches, The Evangelical Synod of North America, and the Reformed Church in the USA. The UCC gave individual congregations a few years to choose whether to align with the new denomination or to remain independent. The Federated Church voted to join the UCC in 1961. Beginning in 1959, The Federated Church participated in an Intern Program through Chicago Theological Seminary. The purpose was to give prospective ministers some experience between their third and fourth years at the seminary. They took part in preaching and worship, Christian education, denominational activities, community affairs, and attended church administrative meetings. The interns were: Thomas Overholt (1959), Ralph Tyksinski (1960), James Dalton (1961), Leigh Fitchen (1962), and David Brink (1963). The Federated Church celebrated the ordination of Milo Sheldon, son of Perrie and Lucille Sheldon, on June 25, 1965. The Rev. Sheldon received his ordination from the Northern Pacific Association of the United Church of Christ. The ceremony represented the first ordination of a young person from The Federated Church. Rev. Van Dyken delivered the sermon, and Mrs. Frank Minars (organist) provided the music. Mrs. Carl Harthen and Mr. Vern Arneson, representing the Board of Deacons & Elders, presented the Rev. Sheldon with a robe as a gift from the congregation. Following the service, there was a reception in the Fellowship Hall. Finally catching up with the times, The Federated Church elected women to the Board of Deacons & Elders in 1962: Deacon Laura Dunlap represented the Congregational Church and Ruling Elder Jo Zenner represented the Presbyterian Church. Soon thereafter, the D&E Board elected Margaret Shaver (Presbyterian) as their “permanent” delegate to the Presbytery, the thinking being that since she was “just a housewife” – with four children at home – she would have the time to attend the monthly meetings! Margaret later served as Moderator of The Presbytery of the Red River – the only woman to hold that distinction, as the Presbyteries were realigned shortly thereafter. At the annual meeting of the congregation in 1967, a motion passed requiring the Deacons & Elders to study in depth the matter of phasing out the federation that composed our church. A committee, appointed to study the matter, met with interested members of the congregation, and made a report at the annual meeting the next year (1968). The report stated that the two separate corporations had operated successfully in a federation for 48 years; that there would be some advantages to de-federation, but also significant legal entanglements in making this change; that the present arrangement paralleled the ecumenical movement toward national church mergers; and that the change to one denomination or the other might produce some internal strife that would be detrimental to the whole. The Board of Deacons & Elders reported that they had “received enlightenment” from the discussion and were aware of certain problems and weaknesses. They did not feel that de-federation was the answer but agreed that further study and work would be made to deal with any problems. Thus, through a surprise motion to discontinue the federation came a study and discussion that made the federation stronger and more successful than it had been before. The Rev. William Barnes ‘Barney’ Kitchen (1971-1974) served as The Federated Church’s first Associate Pastor. This practice continued with the call of the Revs. Susan Adams (1976-1978) and Leah Ntuala (2007-2010) as Associate Pastors. The Rev. William Sebring (1974-1984) followed Rev. Van Dyken, and he in turn was succeeded by the Rev. Stephen Davis (Interim: 1984-1985). In 1974, Doris Enderson organized the congregation’s Handbell Choir; she continues to direct this group today! In 1979 the congregation hired Bonnie Bergerud as Christian Education Coordinator, a post she held until 2006. In 1994, the Rev. Sue DeNio joined the church staff as Director of Shared Ministries. Mission projects over the years included purchasing artificial limbs for people in Bangledesh; used clothing and books for Lowndes County, Alabama; anesthesia equipment and surgical lighting for India; water buffaloes in Thailand; contributions to black colleges; donations for Vietnamese families; Womens’ Crisis Centers; The Community Food Shelf in Fergus Falls; funds to assist two new churches in Minneapolis; help for foreign students continuing education; flood relief; and Bosnian refugees. The congregation recently undertook Mission Initiatives with the intent of making a greater impact on a particular mission: “Nothing but Nets” (2009) raised over $5,700 for anti-malaria mosquito netting in Africa; “Cheaper by the Dozen” (2010-2011) raised $5,040 to support twelve orphans for one year at the Mt. Selinda Orphanage in Zimbabwe; “Feed My Sheep” (2013) offered assistance to local families and individuals in need of assistance with food, rent or utilities; and “House of Hope” (2014), which is well on the way to raising $6000 to pay school fees for students at House of Hope in Zacapa, Guatemala. Mark Tabbut, son of Quintin and Wilma Tabbut, received his ordination at The Federated Church on June 9, 1985. Interim Rev. Stephen Davis presided at the service, and The Rev. William Van Dyken (retired) gave the charge to the new pastor. The Rev. Dr. C. Edward Morgan came to the Federated Church in 1985. Under Ed’s direction, the congregation expanded its programs and grew its membership considerably; Youth Club and The Quest are two notable successes from Ed’s tenure. The Youth Club, which began in 1986, involved grades 3-6 and later expanded to include grades K-6. Activities included Bible study, crafts, recreation, music and dinner. Parents and others were involved with the program. The Quest, a Saturday evening service presented in a casual “come as you are” atmosphere, endeavored to tell God’s message through more contemporary music and a wider variety of medium. Beginning in the fall of 1996 as an outreach to young adults in the community, this service occasionally offered guest speakers and music ranging from bluegrass to gospel to Christian rock. There was lots of singing and audience participation with interactive prayer time. The Quest paved the way for a second Sunday morning worship service; in the summer of 1999 this contemporary service was held outdoors. Following the Rev. Morgan, the congregation called the Revs. Kent Groethe (Interim: 1998-1999), Thomas Gard (1999-2000), and Myles Alexander (Interim: 2001-2003). The Rev. Douglas Dent currently serves as Pastor of The Federated Church (2003-present). The Federated Church began as, and remains, two separate but closely associated congregations, a joint ministry of the Presbyterian Church (USA) and the United Church of Christ (UCC). We have now been federated successfully for over one hundred years and are excited to begin our second century of service. We feel called as a congregation to promote spiritual growth and provide an open, caring atmosphere that affirms each person’s faith journey and reflects Christ’s love under God’s guidance and direction. -provides a variety of music and worship styles.